For those who have not experienced it yet, people would always think about attending entertainment press conferences as something glamorous or fancy. Well, it will always be the first time. But after a moment of being starstruck'ed by the celebrities you meet, you will really end the activity thinking about meeting the deadline, how to frame your article, how to do the layout and spend one long night editing photos. Sometimes, the fairy tale presscon is not like what we actually see on TV. Entertainment columnists get the mic and scold celebrities, actors snickering to each other like those ordinary teenagers in the school canteen, stars revealing info that should have been kept, hosts screaming over the lights man or the sound in-charge because of delays, and celebrities trying hard not to be pissed by non-sense questions. Show business will not be a very profitable industry if not for all the dramas, off and on camera. There has to be something that people should talk about to get something or someone's career afloat. And as colorful as it is amusing, I will give you some of my own experiences and some scenes the newspapers will not tell you. In the press conference of Star Cinema's latest movie "The Reunion", last July 31 at the Dolphy Theater in ABS-CBN Compound, one if its lead stars shifted all of a sudden from being "makulit" to quiet in just one question. A showbiz writer and once TV host popular to us all, Ogie Diaz, asked the actors who among their co-actors in the movie they like most. Bangs Garcia chose Kian Cipriano, not minding Diaz's warning not to choose their love partner in the movie. Megan Young chose her ka-love team Xian Lim. While Julia Montes, though paired with Enrique Gil in the movie, was pressured by the deafening cheers of their fans in the gallery. She chose Enchong Dee. Enchong went very serious. I was not aware there was an ongoing affair or "ligawan" between the two young stars. The unawareness was not a surprise to me. I am not that really updated with showbiz and I know only the most popular happenings in the entertainment circle. Say, Annabelle Rama perhaps and her feud with the rest of the world. I heard one showbiz writer shouting, "Alam mo na pipiliin mo. Nag e-expect na 'yang isa". He was referring to Julia of course to choose Enchong. Later on, another writer shouted: "Bakit di kayo nagkakatinginan sa mata? Magkagalit ba kayo?". The mic was passed around. 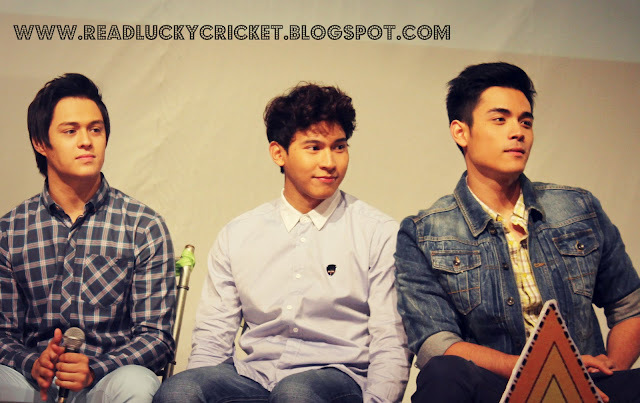 Kian reciprocated and chose Bangs, Xian also chose Megan, and Enchong did the same. He chose Julia back. While seating at the second row from the stage, I heard people talking at my back. "Ayaw kasi nung lola", one said. "Seventeen pa kasi si Julia", another one reacted. Now I know, I told myself in relief after being having a hard following what was happening. 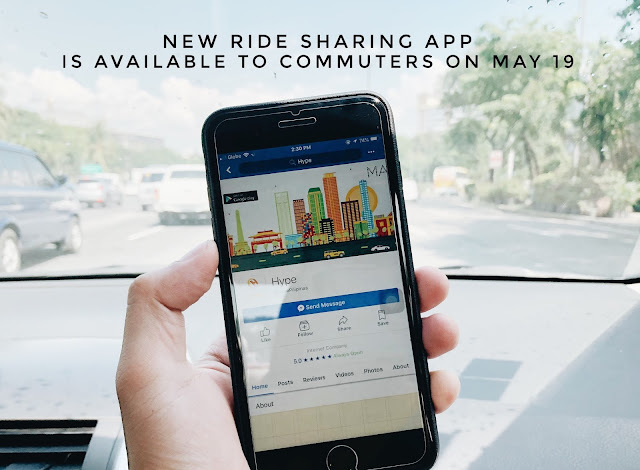 "Sayang naman kung ititigil natin na wala pa namang nagsisimula. 'Wag naman natin pangunahan na nasisira kasi masaya kami. Respeto na lang sa nanay niya, respeto na lang sa lola niya na kapag 18 na siya", Enchong explained to the delight of his fans. by the members of the press. their gay experiences in high school. Moments earlier during the presscon, the cast were throwing out jokes to each other. The first 15 minutes of the presscon were all about "generic" questions, I should say. You know, the likes of "Anong mapupulot ng mga kabataan if mapapanood nila yung movie na 'to?" and "Ano ang pinaka-challenging na part na ginawa niyo sa movie na to?". And in between those, the cast were very busy laughing at each other. I find it half amusing. These are very attractive people and they are very cute. But the most veteran of columnists are in desperate catch for stories that getting their ire is very likely. "Kanina pa kayo naghaharutan diyan. Kung ano man yung mga nakakatawa na nagyari sa shooting ninyo, hindi namin naiintindihan. Wala kaming maisulat", Ogie Diaz started his questioning with this. Kian Cipriano, know for being the super perky and straightforward band vocalist that he is, he asked for apology and explained that they just grew very close to each other after 35 shooting days and had created a certain language only them can understand. It was obvious the group kind of straightened up a bit after what happened. After the presscon, Banana Split's resident comedienne and Clown in a Million champion Karen Dematera grabbed Xian Lim for an interview for her show. 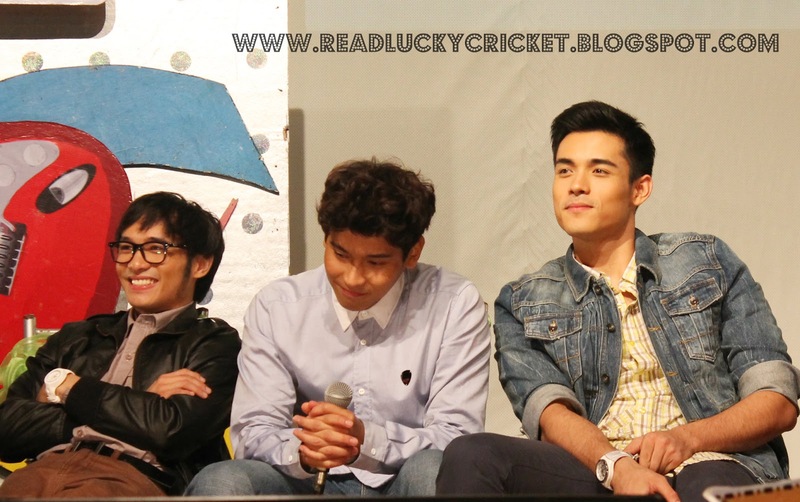 Xian was obviously not ready for the questions but he gracefully answered all of them. What were the questions? "Ano plate number ng kotse mo?" "Nakailang utot ko ngayong araw?" "Nilalamig ka ba?'. All of these interesting behind-the-scene happenings are all for the barkada movie set to be shown in cinemas nationwide on August 15, 2012. The movie boasts off the most popular stars of the new generation today, Enrique Gil, Xian Lim, Enchong Dee, Kian Cipriano, Jesse Mendiola, Megan Young, Bangs Garcia, Julia Montes, Matt Evans and with the cameo role of Christine Reyes. It is also the first full-length project of Frasco Mortiz, son of also director Edgar Mortiz. See you in the cinemas on August 15. You'll never know what's interesting out there! Banana Split's Karen Dematera interviews Xian Lim after the presscon and asked him: "Naka ilang utot ka na today?" Here's the scene right after a presscon is adjourned. The members of the press go straight to the stage to get exclusive interviews with the actors.